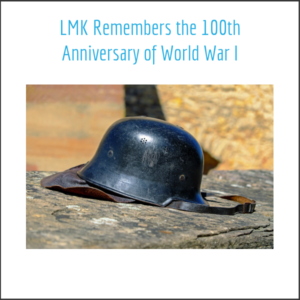 LMK Clinical Research Consulting recognizes our debt to all veterans, past and present. We acknowledge their sacrifice that ensures all Americans may share in our most important principles of freedom, justice, and liberty. These fundamental principles are the foundation of all worthwhile scientific and medical advancement. November 11th, 2018 marks the 100th year anniversary of the end of World War I. Veterans Day, enacted in 1926 by President Eisenhower, first celebrated the sacrifice of those who had died to bring an end to the previously unprecedented conflict of World War I. Originally celebrated as Armistice Day, November 11th later became known as Veterans Day in order to also recognize Veterans of World War II. Veterans Day was first proposed as a national holiday because of what November 11th meant to Americans who had lived through the great and horrible struggle of World War I, a war which left the world irrevocably changed. Remembering the sacrifice of our veterans on Veterans Day can be sobering. It’s easy to focus on the worst of our human past and forget what we have accomplished. Although the horror of World War I reminds us of the devastating potential of misguided progress and misused technology, from the scramble to develop more efficient weapons of war the seeds of many beneficial technologies and industries were born. During World War I, tuberculosis (TB) was the leading cause of discharge among soldiers. Research, therefore, into understanding this largely untreatable disease, was not just a public health imperative but a national security crisis. In response to the desperate need for effective TB treatment, physicians in the United States organized a series of clinical trials in 1926 of a new and controversial drug candidate informally tested by Danish physicians. This unproven drug, sanocrysin, frustrated physicians with the poor and inclusive data gathered from its early trial-and-error use. Its serious side effects, however, concerned physicians. The latent nature of TB, the high toxicity of the drug, and the technological and study-design limits of the time period stymied those who sought to draw real conclusions. The difficulty in appraising the effectiveness of sanocrysin coupled with the great need for an effective TB treatment led to a paradigm-altering decision: Dr. James Burns Amberson and his colleagues decided to toss a coin and privately assign what are thought to be the world’s first randomized and blinded treatment arms. The results of this first trial were negative and disappointing: the paltry benefits did not justify the toxicity. Despite the poor results, the legacy of this trial lives on through its groundbreaking experimental design. Out of this simple but important idea, to flip a coin, modern clinical research was born and millions of human lives were saved. Without the development of this revolutionary placebo-controlled randomized trial design, the discovery of streptomycin in the early 1940s (which cures most TB) would not have been possible. The invention of the controlled and randomized clinical trial is not the only advancement that sprung from the struggle of the first World War. World War I revolutionized medicine with advances in antiseptics, anesthesia, and blood transfusion, and quickly conveyed advancements in other industries and materials into the clinic. These ironic and positive unintended consequences of World War I remind us of the other side of the coin of progress. Since both World Wars, poverty and hunger have shrunken considerably worldwide. Preventable disease continue to be rooted out, and our most complex diseases are threatened by the same technologies that once threatened to destroy us all. Many of these advances are the product of advances in biopharmaceutical technology. As pharmaceutical professionals, we are all stewards of this progress that our veterans entrusted to us. We know that simple ideas and choices, like flipping a coin in the right context, can change the world as much as any weapon of war.